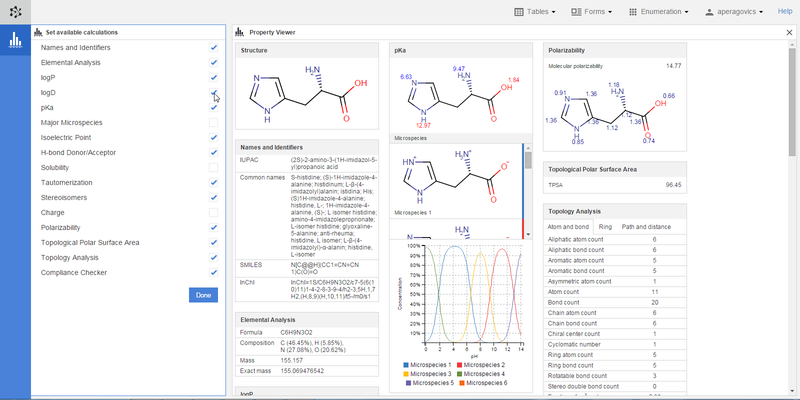 You can calculate physico-chemical and structural properties of individual chemical species and summarize the calculated properties in a single page. You can navigate to this page by right-clicking on a structure in a spreadsheet and selecting the "View properties" option from the context menu. You can see an example of this page in the image below. You can find the widgets with the calculated properties listed below. Following the links, you can read a more detailed description about how these properties are determined. Names and Identifiers: lists the traditional and IUPAC names as well as the SMILES and InChi identifiers of the compound. Elemental Analysis: lists basic descriptors related to the elemental composition of the molecule (e.g., formula, composition, mass). logP: displays cLogP (i.e.,the n-octanol/water partition coefficient of the non-ionized species calculated from atomic contributions), the logD value (i.e., the distribution coefficient, which takes into consideration all - ionized and non-ionized - forms of the compound at a given pH) at the isoelectric point, and the atomic contributions to the cLogP value from each atom. 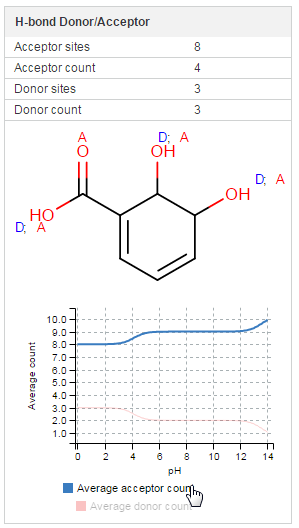 logD: displays a chart about the pH-dependence of the logD value of the compound and lists logD at four different pH values. pKa: Displays the pKa value for each protonable/deprotonable functional group, lists all possible microspecies, and displays the distribution of the microspecies. Major Microspecies: lists the major microspecies (protonation forms) of the compound at a given pH. Isoelectric Point: Displays the calculated isoelectric point (pI), i.e., the pH at which the compound carries no net electrical charge, and a chart about the pH-dependence of the net electrical charge. H-bond Donor/Acceptor: displays the hydrogen bond donors and acceptors of the molecule as well as a chart about the pH-dependence of the donor and acceptor site numbers. Solubility: displays the solubility of a compound using a fragment-based method that identifies different structural fragments in the molecule and calculates their solubility contribution. Tautomerization: displays the tautomers of the compound along with their percentage distribution. Stereoisomers: displays the number of stereoisomers of the compound and the configuration of the chiral centers in the given isomer. Charge: displays the atomic charges of the compound. Polarizability: displays the molecular polarizability as well as atomic polarizability values of the heavy atoms in Å3. Topological Polar Surface Area: displays the polar surface area of the compound in Å2 based on the method described by Ertl et al. Topology Analysis: lists several topological descriptors, such as atom or bond related descriptors (e.g., aliphatic/aromatic atom/bond count), ring related descriptors (e.g., smallest ring size), or path and distance related descriptors (e.g., Wiener index, steric effect index of atoms). Compliance Checker: checks whether your compound is controlled according to the relevant laws of the countries of interest. The properties on this page are determined automatically using the default options and values for the calculation. However, you can modify these options and update your calculations by clicking the gear icon in the upper right corner of a widget. (Note that this icon appears only when you hover over the widget in question.) When you modified the options, you can re-calculate the property in question by using the "Update" button. You can return to the default settings anytime by using the "Reset" button. For some options, additional helper text is provided with some extra information. To see these helper texts, you have to hover over the particular option. Several property boxes contain diagrams that show useful information, trends about the behaviour of your compound. These diagrams are interactive and allow you to answer your specific questions by focusing on different parts. When you hover over a specific point of the chart, you will see the respective values of the horizontal and vertical axes in a tooltip. If there are multiple lines on a chart, you can focus on a selected curve by hovering over its name in the legend of the chart. You can also remove a line from the chart by clicking on its name. You can also easily zoom in a chart using the scroll wheel of your mouse. Panning is also available after zooming in. 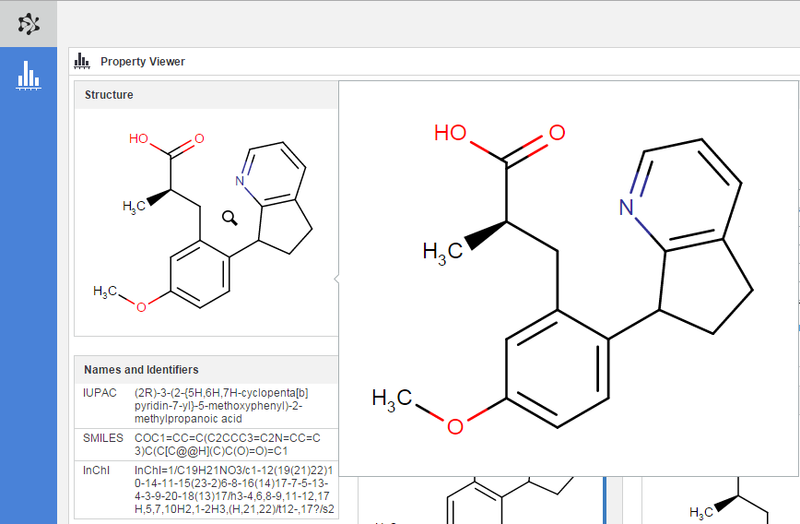 The Property Viewer page offers a lot of information about the compound of your interest but you might want to go into more details regarding a particular property or just simply you might want to enlarge a molecule for better visibility. In order to do so, you should hover over a picture that contains a structure itself or a structure containing special labels. The cursor will change into a magnifier indicating that the given picture can be enlarged. If you click on the structure, the magnified picture will appear next to the property box for more detailed examination. Plexus Design offers a pre-defined set of calculations that are available by default for characterizing your molecules. However, we are aware that not all of them might be important in your particular project and you might want to remove some of them in order to improve transparency. You can easily achieve this by clicking on the icon on the left-side action bar and opening a drawer that contains the list of calculations that are availabe for you in Plexus Design. In order to remove a calculation from the summary page, you should untick a property in question and it will be immediately removed from the set of calculations. You can remove calculations one-by-one using this drawer and also you can add desired calculations using the same logic. 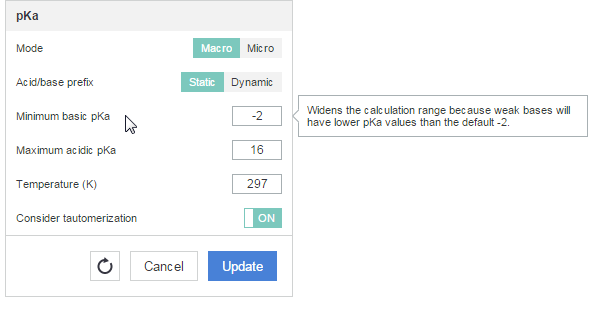 Every time you use this page, you will have the option to alter your calculation set. Your changes are automatically saved and your preferences are stored until your next modification. This way, you can see your preferred set of calculations every time you launch the Property Viewer page. Your preferences will also be available upon your next login. Would you like to calculate properties for a larger compound set? Learn how to do it by visiting this page.